If you love the flavor of the curry, but the stir fry cooking method, you’ll love this Thai recipe. Along with chicken stir fried with holy basil, chicken stir fried in red curry paste, known as gai pad prik gaeng (ไก่ผัดพริกแกง) in Thai, is one of my favorite quick and easy Thai street food dishes. The best thing about this dish is that it’s available at nearly every single Thai stir fry street food restaurant, and while it’s excellent on the streets, it’s even better when you make it at home using freshly made red curry paste. 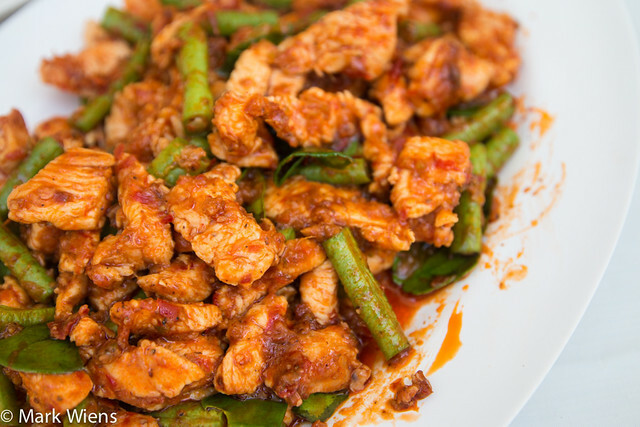 This gai pad prik gaeng recipe (ไก่ผัดพริกแกง) is really easy to make, as long as you already have some Thai red curry paste (เครื่องแกงเผ็ด) available. The Thai red curry paste forms the base of flavor for this gai pad prik gaeng (chicken fried with red curry paste ไก่ผัดพริกแกง). Note: If you want to get straight to the directions of this recipe, you can scroll below to the recipe box, otherwise keep reading for a more thorough explanation of how to cook this Thai chicken stir fried curry recipe. Note #2: Making your own red curry paste is the best option, but if you’re not able to, you can try using red curry paste in a jar, my recommendation is for Mae Ploy red curry paste, but you’ll have to alter the salt and other seasonings in the recipe depending on the flavor of the packaged curry paste. 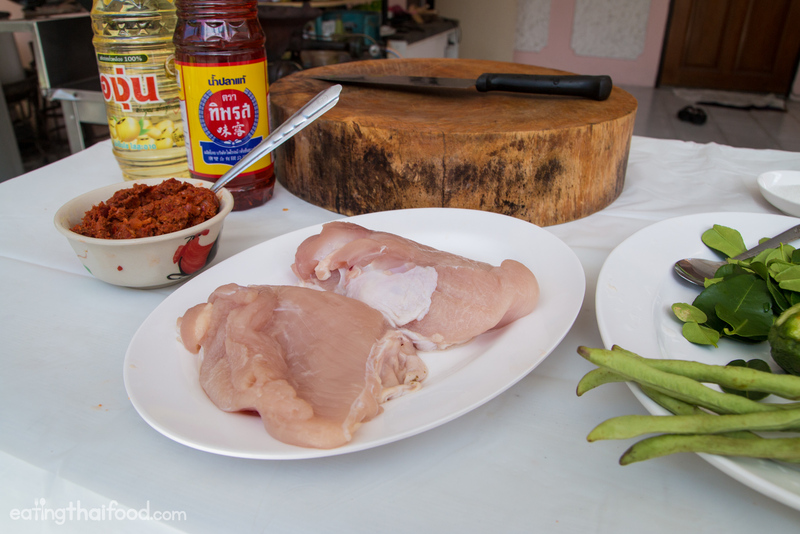 Once you have your Thai red curry paste ready to go, either freshly made, or from a can or bottle (but fresh is of course going to taste better), you’ve just got to fry it up with some chicken and a few other ingredients, and you’re ready to go. I used about 300 grams of chicken breast, which was 1.5 chicken breasts altogether. First slice the chicken into small bite sizes pieces – I like to slice it pretty small because more flavor gets coated on each piece of chicken, plus it’s faster to fry. Along with Thai red curry paste and chicken (ไก่), for this recipe I used Chinese long beans (ถั่วฝักยาว, but I think green beans will also work fine), and kaffir lime leaves. I used about 3 strands of long beans, cut into 1 inch pieces, and it equaled out to about 1/3 of a cup of them. So if you use green beans, chop up enough for about 1/3 of a cup. Since most of the amazing flavors are already taken care of the in red curry paste, you barely need any other seasoning. Other than the paste, you’ll just need about 1 teaspoon of fish sauce (น้ำปลา taste it though, it depends on how salty your red curry paste is from the start), and normal Thais would add about 1 teaspoon of sugar, but when I make this recipe for myself I add just a pinch, if any, and that’s all. Stir frying food is one of my favorite things to do in the world, it’s such a fast way to cook, and all the flavors remain in the pan and with the ingredients you fry. For this gai pad prik gaeng recipe (ไก่ผัดพริกแกง), once all your ingredients are ready to go, turn on your stove to low heat. Add about 1 tablespoon of oil (น้ำมัน) to your wok or pan, keeping it on low heat, and you can add in about 3 tablespoons of Thai red curry paste before the oil heats up too much. If your pan is too hot the curry paste will burn, so keep it on low heat and just stir fry for about 30 seconds. After your red curry paste is hot sizzling and fragrant, toss in your chicken, and season with a bit of fish sauce (red curry pastes can taste different and be of different saltiness, so make sure you taste test and see how it is before adding fish sauce), and a pinch of sugar, and fry until the chicken is all the way cooked. Finally, at the end, toss in your long beans and kaffir lime leaves, stir fry for about 30 more seconds and your marvelous gai pad prik gaeng (ไก่ผัดพริกแกง) is ready. 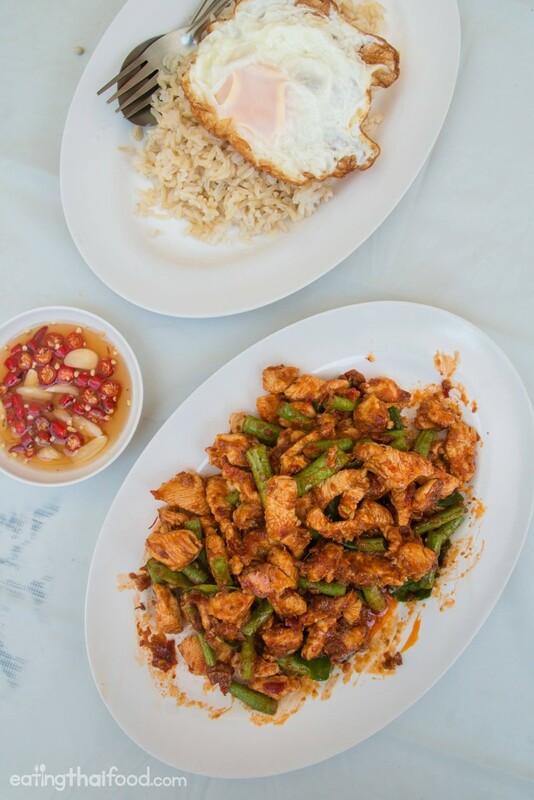 You can either serve gai pad prik gaeng (ไก่ผัดพริกแกง) directly over a plate of rice, or you can put it all onto a communal plate accompanied by a separate plate of rice. Either way tastes just as good. In Thailand when you order a dish like gai pad prik gaeng (ไก่ผัดพริกแกง), or any other stir fry dish, you have the choice to get a fried egg on the side. This is not a requirement, but a fried egg on top of your rice along with the red curry paste chicken sure tastes incredible. Before we get started making this recipe, be sure to watch the video below for all the cooking instructions and details. Be sure to check out our other Thai recipes here. 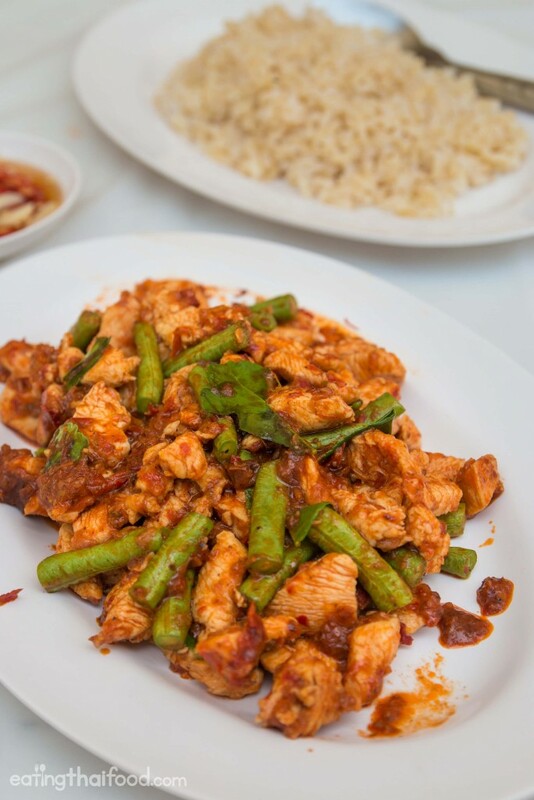 Gai pad prik gaeng (ไก่ผัดพริกแกง) is a commonly available Thai street food dish that includes chicken (or another meat of choice) stir fried up with Thai red curry paste. It's almost like a dry curry, all the coating of the curry paste coating the meat in amazing flavor. Give this recipe a try, it's truly a flavor exciting Thai dish. 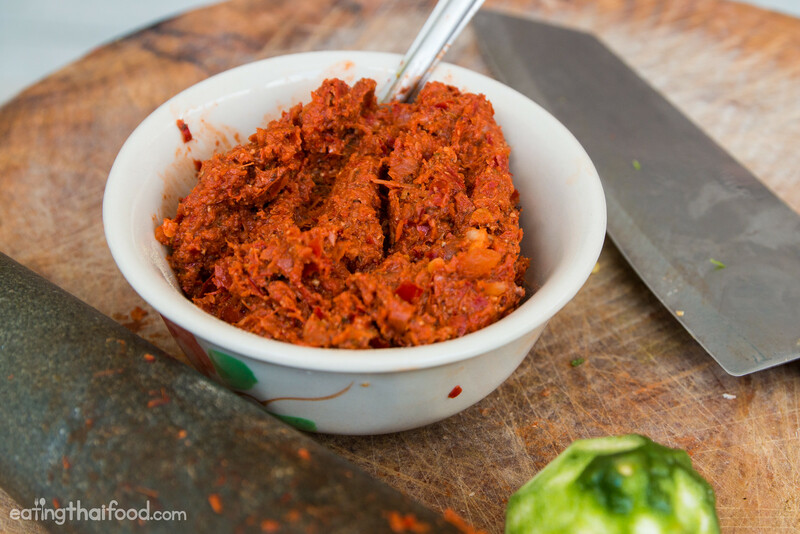 3 tablespoons Thai red curry paste (recipe here), or alternatively packaged red curry paste, but it won't be as good. The first thing you need to do is take your chicken and slice it into small bite sized pieces. I like to cut it quite fine so there’s more surface area for flavor, and so it cooks quicker. Cut the Chinese long beans (or green beans) into 1 inch pieces. Once your chicken and long beans are cut, go ahead and light your stove on low heat and add in 1 tablespoon of oil. You really need to use about 1 tablespoon of oil, if you use less, the curry paste will burn and stick to the pan. No need to wait until your oil is hot, just toss in about 3 tablespoons of red curry paste into the oil and start stir frying it in the oil. Let it sizzle for about 20 - 30 seconds on low heat, and it should really be fragrant (you might even cough from the frying chilies!). Next add your chicken, turn up the heat to high, and start stir frying constantly, fully mixing the chicken with the curry sauce. Quickly season with 1 teaspoon of fish sauce (give your curry paste a test to see how salty it already is, from the package it might be saltier than the homemade version), and ½ teaspoon sugar. Stir fry constantly, and at this point if it’s getting dry, add a couple tablespoons of water. Keep stir frying the chicken on high heat for about 2 minutes until the chicken is fully cooked. 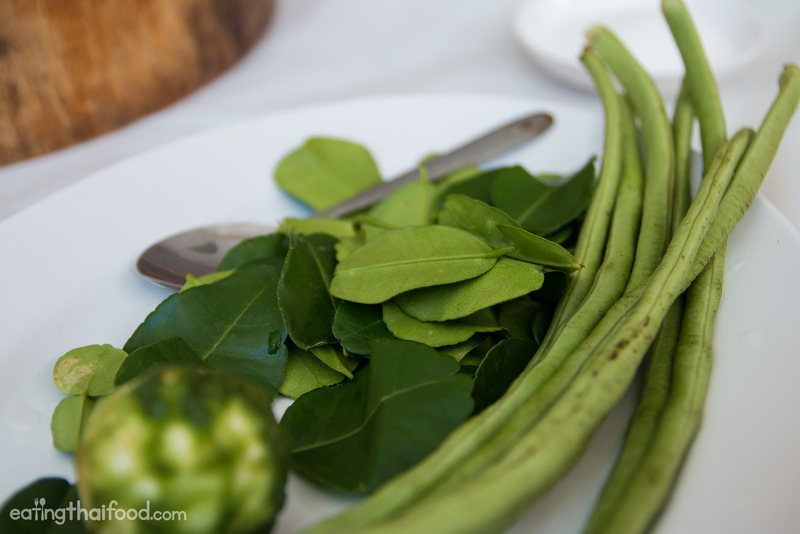 When the chicken is fully cooked, add the sliced long beans, and then break in about 3 - 5 kaffir limes leaves. Stir fry for just 30 seconds and then turn off the heat. You want the long beans to still be nice and crisp. 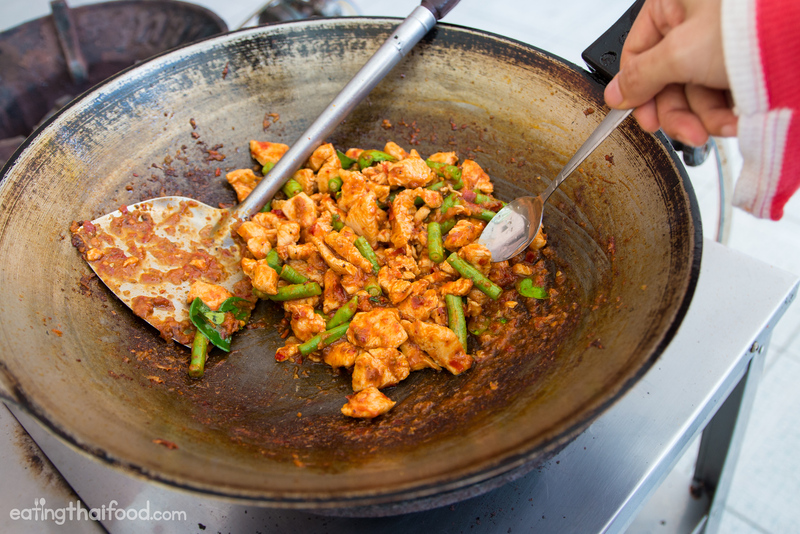 Dish your gai pad prik gaeng (ไก่ผัดพริกแกง) out onto a plate and serve with freshly steamed rice. 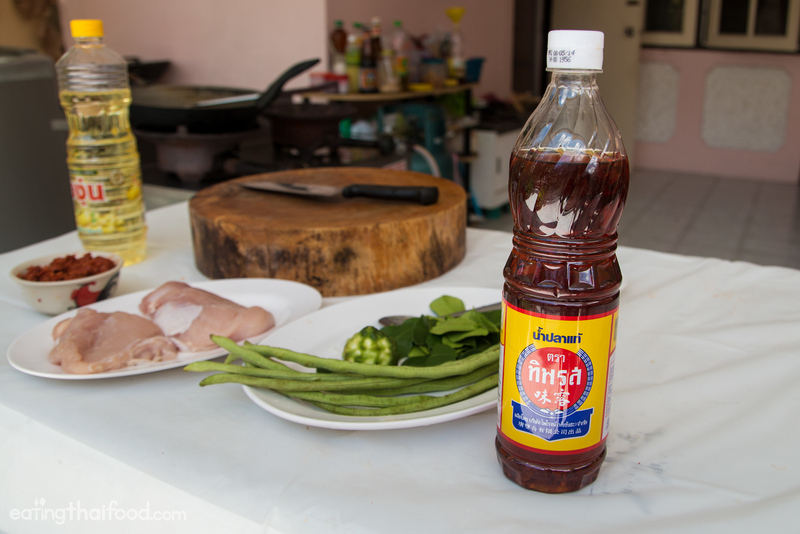 To make your dish extra authentic, you can make a small bowl of prik nam pla, or fish sauce and chilies. Just dice up a few Thai chilies, and a clove of garlic, and add a couple tablespoons of fish sauce, and if you like, a squeeze of lime juice. With each bite, you can scoop on a few pieces of chili and a drizzle of fish sauce – tastes especially wonderful on the egg. Gai pad prik gaeng (ไก่ผัดพริกแกง) has such a wonderful fresh and pungent flavor. You’ll taste the dry chilies, garlic, shallots, and the lime zest from the kaffir limes leaves, and the kaffir lime peel in the paste. It’s an extremely flavorful Thai dish. One more close up of that amazing flavor! 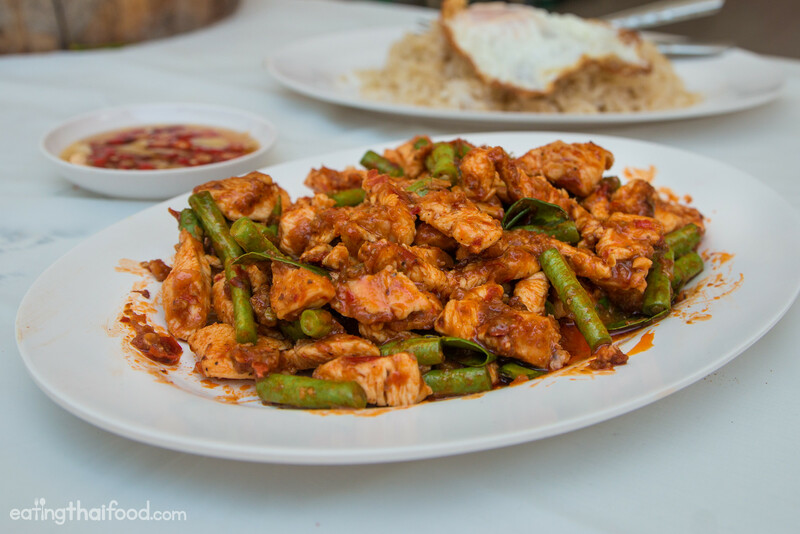 Gai pad prik gaeng (ไก่ผัดพริกแกง) is a Thai dish that includes chicken stir fried in curry paste with long beans and kaffir lime leaves. It’s one of my personal go-to Thai dishes in Bangkok, and so I’m excited to share with you this quick and simple recipe that tastes so incredibly delicious. Eating gai pad prik gaeng (ไก่ผัดพริกแกง) is like having all the curry flavor coated onto pieces of chicken, and it’s absolutely delicious! 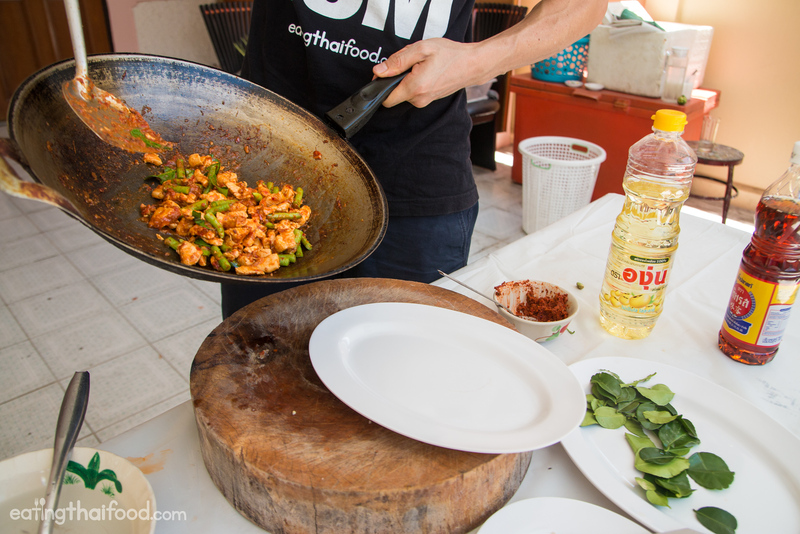 Want to cook more authentic Thai food? More recipes here. Hi Mark! This is one of my favourite Thai dishes and it’s amazing to find that it’s not difficult to pull off at home. Two questions: First, is it okay to use thigh instead of breast? I don’t care for white meat but if it’s traditional, so be it. Second is a more general question: today a restaurant owner INSISTED that traditionally in Thailand, rice is served ON TOP of the curry (or stir fry, whatever). I said that I’ve been enjoying Thai food for decades and have never once seen it served that way and referenced your videos as support, eg among the many vids of curries with fish and other delicacies ladled onto a bed of rice in a bowl. He responded by saying that he’s been to Thailand “many times,” and that was that. I’ve never been to Thailand but I know folks who’ve not only visited but were either from there before immigrating here to Canada or who have lived there, some for years, but you’re my most-trusted Thai food expert so I’m asking you- where does rice (plain jasmine rice, not sticky rice to be clear) go? On the bottom top, side, or are we both wrong? I appreciate your collection of recipes and believe them to be some of the tastiest. Your commentary is concise thorough and thoughtful. I hope to try all of the recipes that you have included here in this bit of cyber space. ???????? Thank you very much Crystal! Thank you providing these lovely recipes. This one is great. I have not tried it with chicken yet, but have made it a few times with white fish. It is so tangy, tasty and easy. 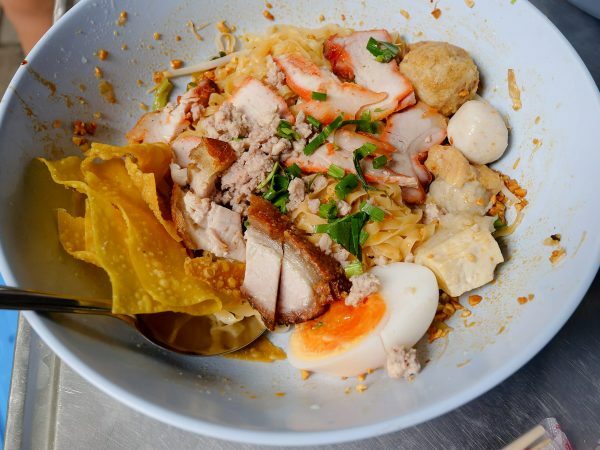 Real comfort food, especially with some sticky rice and a fried egg. Yum! my local Thai restaurant makes this, but adds coconut milk as well. So good I could just drink the broth. I usually order it with shrimp rather than chicken. Great recipe, your passion for Thai food is impressive. Thank you very much Savannah! I have to say that I only found your website after visiting Thailand and I wish I had discovered it before. I made this dish tonight with my wife and it took us right back to Bangkok. I must say that after making your Red Curry paste and then making Gai Pad Prik Gaeng, this was definitely the most spiciest dish me and my wife have ever had and we loved it. Please keep making your great videos. Hi Gavin, great to hear from you, thank you very much for your kinds words. I’m so glad you made the red curry paste and gai pad prik gaeng, and that you enjoyed the spice! Thank you for following, more recipes coming. You’re welcome Trent, glad it’s helpful. Mark, Do you have a preference for “Off the Shelf” red curry paste? Thank you in advance for any suggestions. Hi Bob, I’m sorry, I haven’t tried any canned curry paste in years and year, so I don’t have a personal recommendation. But if I try one, I’ll let you know. Sorry about that. Great, thank you for the recommendation Steve, I’ll try to check it out when I have a chance. So in my experience this dish usually has tamarind sauce/ paste added in. It adds a sweetness to the dish. What are your thoughts on this? Hi Charly, good to hear from you. I haven’t normally seen gai pad prik gaeng with tamarin paste, what I’ve normally seen is mostly the curry paste, and sometimes some prik pao, roasted chili paste sauce. But tamarind paste sounds like it would be delicious! Have you tried cooking it? 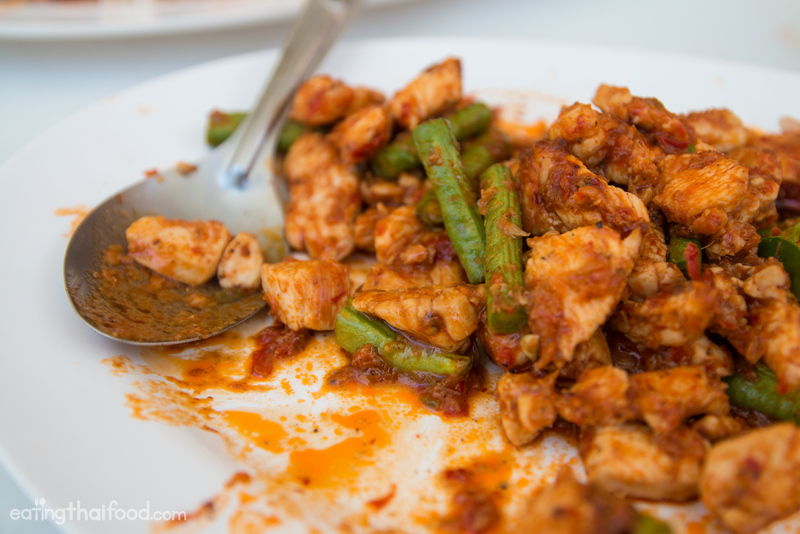 Mark, I had Pad Prik Gaeng in Pang Mapha about 5 years ago, loved it and have been searching for a recipe since. Your recipe is the first I have found, and your photos look exactly as I recall it. I was fortunate enough to be in the region when “mountain truffles” were available and these were added to this delicious dish as a special treat. Hey Steve, great to hear from you, thank you very much for sharing about your experience with this dish, and those mountain truffles sound wonderful! Hey, I have a question . Have you tried to do this dish with curry paste from the store ? Sometimes there is no time to make your own paste. Hi Martin, I haven’t tried myself, because I live in Thailand and it’s easier to get the fresh version, but I think it should work fine. Let me know if you give it a try. It came out very good , I have no comparison because Thailand did not eat it , but in March for sure try . Great to hear that Martin! 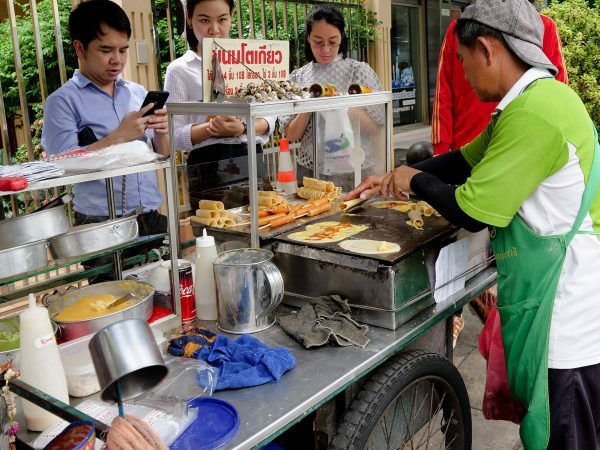 I don’t know why but i think about steamed sticky rice in small basket too..
Mark, you traveled a lot, may i ask you which country you found the best Veg street food? Thank you Pascal. I do like veg food, but since I’m not vegetarian, I don’t always pay attention to what veg food is available. But I think for me, the best veg food, and the most available, I’ve had is in India. Yes, you right. When i lived in South India, i was addicted by south indian food. The food was so simple, veg and tasty. Meat/meat products was not necessary to make a tasty meal. It’s quite uncomon. Wow, thanks for sharing Pascal, that sounds incredibly delicious. What is “torified”? Did you mean toasted? In many South Indian recipes, and recipes from all over India, and in Thai recipes, spices are often dry roasted to allow their aroma to become more volatile. In cooking, the Maillard reaction is what produces some of the most delicious flavor compounds. But there not a large separation between the temperature at which this occurs, and temperatures at which pyrolysis occurs, and the latter produces bitter compounds. So “burnt” flavors often have a bitter profile. Being Indian, I am somewhat unusually, not a big fan of South Indian food. I can eat it a few times, but soon tire of it. North Indian vegetarian food is also quite varied, seasonal, and can be made delicious. In particular the cooking from Bengal (see Mark’s episode at Bhojohori Manna in Kolkata – though he mainly had river prawns and fish) has a large range of vegetarian recipes – ranging from shukto, chochhori, dalna, jhol, chechhki, labra – these are categories of cooking and can use many different vegetables. Hi Suvro, thank you so much for sharing your insights into spices. Yah, I’ve attempted to cook some Indian food and toasted the spices, and you really do have to be careful about bringing out all the flavor and burning them. Thanks for sharing. Could I use massaman curry paste? Hi Tracy, it wouldn’t normally be used, but that’s not a bad idea. You should give it a try! Your fish sauce link is broken!! !